Use the KENWOOD DSP Control App(compatible with iPhone and Android) to setup the XR600-6DSP. The listening position, advanced equalization and filtering can be set during installation and the setting stored in memory. A simplified mode is available for day to day use. The 32-Bit 192kHz DSP gives the flexibility of independent tuning and equalization that is required with the variance of speakers and location challenges being used in a typical system. 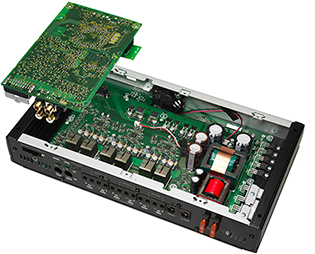 The channel flexibility allows any function or tuning on all 10 channels making it one of the most versatile solution based amplifiers on the market today. A vehicle specific harness will allow connection between the factory radio plug, the iDatalink AR Module and the XR600-6DSP making the installation efficient and simple. This type of connector is non-corrosive and will maintain conductivity for long periods of time. Gold-plated connectors inherently have lower contact resistance resulting in wider frequency response, lower distortion with improved dynamic range and signal to noise ratio.